Flash forward to the other night. We took our boys to see The Wiggles. This year, it was in a much different venue and the show style had changed. Not only did The Wiggles sing and dance, but they also showed althleticism. I kid you not, the Wiggles Go Bananas tour seemed like a hybrid of Cirque du Soleil meets The Wiggles. It was amazing watching Anthony stand on his head, do cartwheels, and fly in the air. Even Captain Feathersword got into the act. Here’s a video that we took of one of the classic Wiggles songs. At the end of the clip, you will see a little of what I mean with Jeff and Captain Feathersword (there was so much more with crazy props and things). 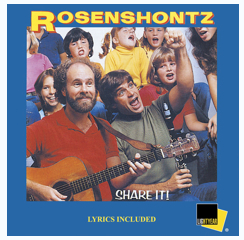 This weeks question is inspired by The Wiggles and my memories of Rosenshontz. What was your favorite concert that you went to as a child? Do you take your children to concerts? If you do which ones? I didn’t go to any concerts as a child, but my very first was to see Neil Diamond and the first concert I took my daughter to see was Cher, we had a blast. She will remember it to this day. It was so much fun. She was 8 at the time and she stood on a chair and we just danced our hearts out. How fun!!! I went to a lot of country music concerts as a kid. I remember The Oakridge Boys, Jodi Messina, The Charlie Daniels Band, John Anderson, Vince Gill, and Billy Ray Cyrus. I’ll probably remember more if I think about it long enough. My kids have never been to a concert, but we live in a much smaller town than the one I grew up in. .-= Andrea @ChocolateFingerprints.net´s last blog ..Tiny Prints Has Got You Covered for the Holidays! =-. I once went to Disney on ice, I like that. .-= AuntieE´s last blog ..Aloha Friday -Window Views =-. Not to date myself….they really didn’t have these kind of things when I was little. I did take my kids to see the annual Elmo Show that would come here when they were young. I have only taken my son to go see the Wiggles. He was about 3 when we took him. He loved it. 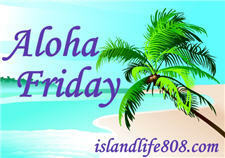 .-= Melanie @ Whimsical Creations´s last blog ..Aloha Friday #3 =-. .-= noelle d´s last blog ..Aloha Friday # 8 =-. I never went to concerts as a kid and so far I haven’t been able to take my kids to any — just too expensive for us nowadays! I don’t remember ever going to a concert when I was a kid. I have taken my daughter to the Wiggles concert. .-= Mrs. Marine´s last blog ..Aloha Friday #9 =-. I also didn’t go to any concerts as a kid. Well I do remember seeing Simon and Garfunkel in Central Park but that was because we were in the city visiting friends of the family and just happened across the concert. But my parents didn’t take me to things like that. We’ve only taken Alex to Dora Live but he was 3, but are taking the kids to Sesame Street Live in a few weeks as Zach’s birthday present. They’re both really looking forward to it. My favorite concert as a child was probably the Feather River Jam…had a number of different singers and we had back stage passes. Super fun! I do take my girls to concerts…they are 6 years old. But they are concerts like…when they were little they went to to Wiggles concerts and for their birthday we are going to get them Hannah Montana tickets. .-= Kandi´s last blog ..Aloha Friday…Parenting Advice =-. We didn’t go to concerts when I was a child, being in the orphanage and all. Now I don’t take my kids to concerts because I don’t know of any, but if I do then I will. I never really went to concerts until I was a teenager. I did do Sesame Street on ice once, and I liked that. I’ve taken the kids to shows like that half a dozen times but never to a “real” concert. We have done concerts in the park and stuff like that, too, which I love to do. .-= Smellyann´s last blog ..Sunday Stealing =-.